Physicians, trainees and even laypeople can now experience what it's like inside the operating room as an expert radiologist performs one of the most difficult medical procedures of its kind. Ziv Haskal, MD, of the University of Virginia Health System, has created a dramatic teaching tool using the power of virtual reality. Whether watched on a high-end VR system or a $15 cardboard viewer, Haskal's virtual procedure puts the viewer right in the operating room with him as he creates a new blood vessel through a small nick in a patient's neck. It's a complicated procedure – Haskal calls it an "interventional radiology heptathlon" – and his use of VR is set to transform how it is taught. "The current means of teaching is a physical person has to arrive … and go over with the doc beforehand. Or they have to look at a lousy 2D animation on a screen," Haskal said. "Once you put [VR] glasses on people, it's like you walk them through a completely different door." 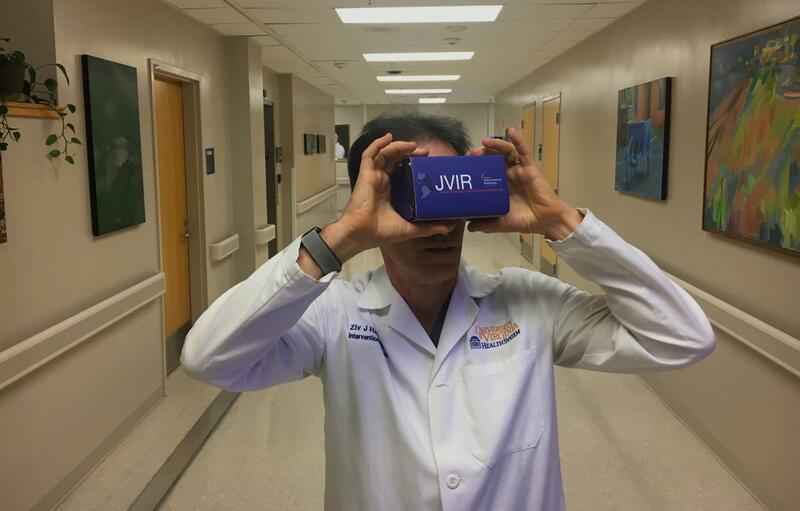 Haskal is set to unveil the VR tool in dramatic fashion this weekend, when he plans to ask approximately 200 attendees at the SIR 2018 Scientific Meeting in Los Angeles to don VR goggles simultaneously and step into the operating room with him. "Culmination of eons of work," he recently tweeted. "Blow your mind/See the future."